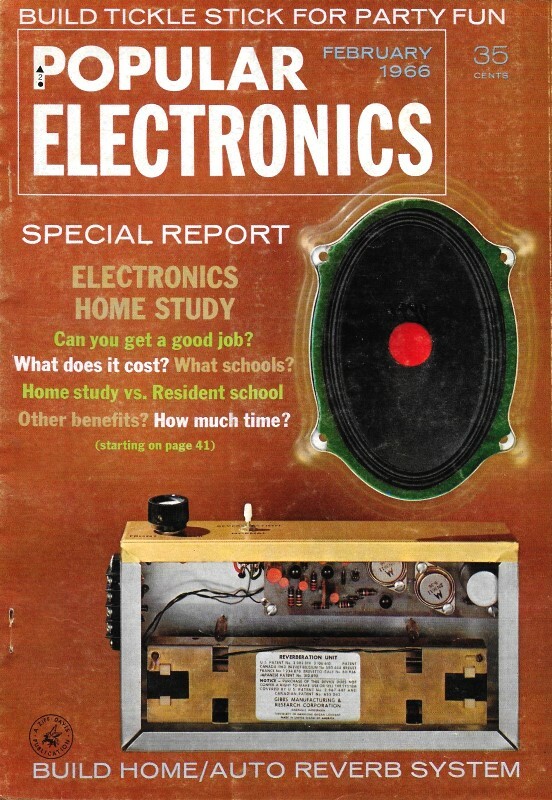 A lot of RF Cafe visitors might not be familiar with some of the electronic devices presented in this Electrochemistry Quiz by Popular Electronics' resident quizmaster, Robert Balin (a big list of his other quizzes is at the bottom of the page). I offer my assistance. A is a photocell, B is an early type of rectifier, C is a varistor, D is a cathode ray tube (CRT), E is an electrolytic capacitor, F is a heated cathode in a vacuum tube, G is a flashlight battery, H is an early receiver crystal detector, I is a magnetic audio recording tape, and J is phonograph cartridge. I scored 60% - sad. The operating characteristics of many electronic components are directly dependent on the chemical properties of materials used in their manufacture. Test your knowledge of chemistry by matching the chemicals (1−10) listed in the column at right with the sketches (A−J) of the electronic components in which they ore used. 1 - E The Aluminum Oxide which forms on the aluminum electrode in an electrolytic capacitor serves as the dielectric material. 2 - J Barium Titanate is the piezo­electric material used in the manufacture of ceramic phonograph cartridges. 3 - A Cadmium Sulfide is one of a number of materials used to make photocells. 4 - B Cuprous Oxide serves as the P. type semiconductor in copper oxide rectifiers. 5 - I Ferric Oxide (or iron oxide) particles are used as the magnetic material in recording tapes. 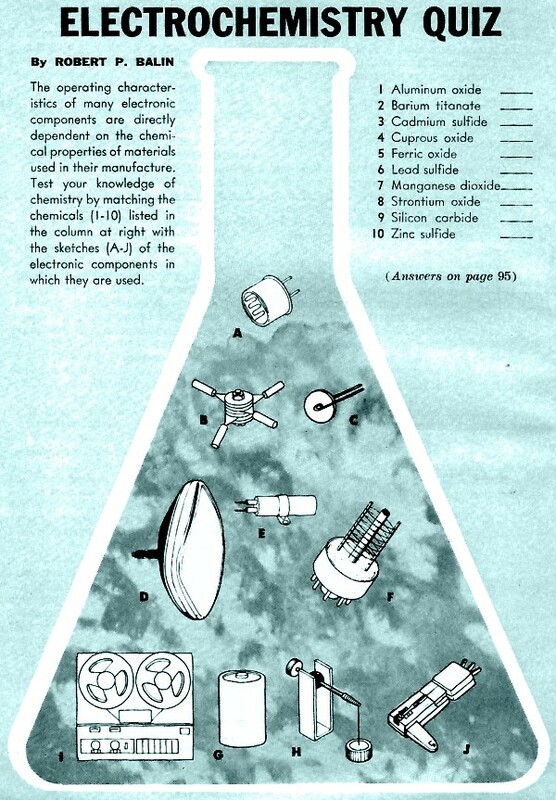 6 - H Lead Sulfide crystals were used in the manufacture of galena signal rectifiers for early crystal receivers. 7 - G Manganese Dioxide is used as the depolarizer in the common flashlight cell. 8 - F A mixture of Strontium Oxide and barium oxide forms the electron emitting coating on the cathode of receiving tubes. 9 - C Silicon Carbide is used in the manufacture of varistors - voltage-sensitive resistors - used as voltage regulators and lightning arresters. 10 - D Zinc Sulfide is used with a silver activator as a type P-4 (medium-short persistence) phosphor in cathode-ray tubes.